Multidetector Computed Tomography; Angiography; Vasculature, Pulmonary artery, Hemoptysis. The expectoration of blood originating from the lower respiratory tract, called hemoptysis, is a common clinical condition with many potential etiologies. Massive hemoptysis is life threatening and needs urgent intervention. Multidetector computed tomography (MDCT) is a useful non-invasive imaging modality for the initial assessment of hemoptysis. Using MDCT with multiplanar reformatted images has improved the diagnosis and management of hemoptysis by providing a more precise depiction of bronchial and non-bronchial systemic arteries than conventional computed tomography (CT). In 95% of hemoptysis cases, the systemic arterial system is the origin of bleeding and pulmonary vascular anomalies are a rare cause. Among these, pulmonary arteriovenous malformation, hereditary hemorrhagic telangiectasia, and Osler-Weber-Rendu disease are well known entities. However, primary anomalies affecting pulmonary vessels in the mediastinum or diseases secondarily affecting the pulmonary vessels are unusual causes. Here we present three cases where patients had pulmonary vascular anomalies causing hemoptysis. These patients had decreased pulmonary arterial pressures leading to bronchial and systemic arterial hypertrophy and development of bronchopulmonary collaterals. Secondary CT signs in the parenchyma and mediastinum (mosaic attenuation, ground glass haze, subpleural interstitial thickening, and hypertrophied bronchial arteries) were similar in all patients. Hence, evaluation of the MDCT images for primary abnormality led to the diagnosis. Various congenital and acquired anomalies affect the pulmonary vasculature. Awareness of the radiologic manifestations of the disease entities and potential complications secondary to infection, vasculitis, or collateralization may aid early diagnosis. We report the cases of three patients who presented with hemoptysis. The right pulmonary artery was affected in all three, either due to a congenital or acquired cause, and led to systemic collateralization, which resulted in hemoptysis. Figure 1: Axial computed tomography section of upper chest (lung window) showed small right hemithorax and interlobular septal thickening. 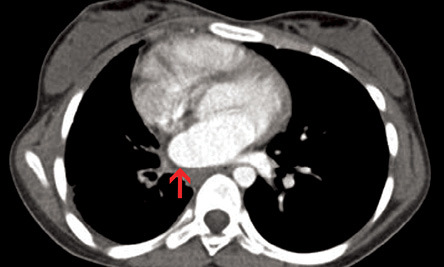 Figure 2: Axial contrast-enhanced computed tomography section (mediastinal window) revealed smooth left atrial wall at the expected location of right pulmonary vein (red arrow). Figure 3: Axial contrast-enhanced computed tomography section at the level of right pulmonary artery revealed small right pulmonary artery and conﬂuent hilar and mediastinal soft tissue with tortuous collaterals. 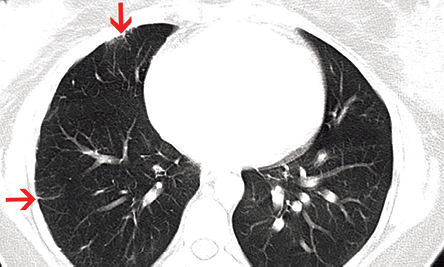 Figure 4: Coronal contrast-enhanced computed tomography section revealed peribronchial soft tissue with bronchial collaterals (red arrow). 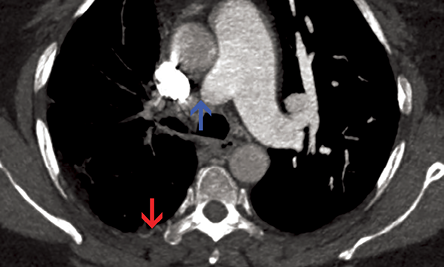 Figure 5: Axial contrast-enhanced computed tomography section revealed sudden interruption of right branch of pulmonary artery in its proximal part (blue arrow). Irregular pleural thickening and intercostal collaterals were also evident (red arrow). The main pulmonary artery and its left branch were normal. Figure 6: Axial computed tomography section showed focal pleural and subpleural interstitial thickening in right lung secondary to collateral intercostal arteries (red arrows). 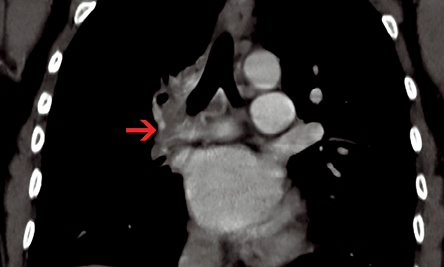 Figure 7: Axial contrast-enhanced computed tomography section showed abrupt narrowing of distal part of right pulmonary artery with hypodense contracted thrombus in its periphery (red arrow). An 11-year-old female presented with history of fever that had lasted for one month and hemoptysis and cough that had lasted for three days. Her hemogram, erythrocyte sedimentation rate, and platelets were within normal limits. Chest radiograph showed small right hemithorax with ipsilateral mediastinal shift. 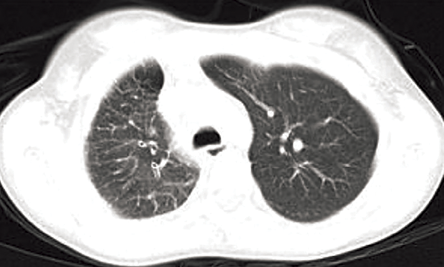 A computed tomography (CT) scan of the chest (lung window) showed small right hemithorax and interlobular septal thickening [Figure 1]. Contrast-enhanced CT scan (mediastinal window) revealed a smooth left atrial wall at the expected location of right pulmonary veins [Figure 2] and conﬂuent hilar and mediastinal soft tissue with tortuous collaterals along the right main bronchus [Figure 3 and 4]. The right branch of pulmonary artery was small. She was diagnosed with pulmonary venous atresia. A 46-year-old female presented with hemoptysis. She reported coughing approximately 100ml of blood three times in the previous five days. She had no history of fever or cough. A similar episode happened six months before, which resolved spontaneously. No investigation was done at that time. Her chest radiograph showed small right hilum and normal lung fields. 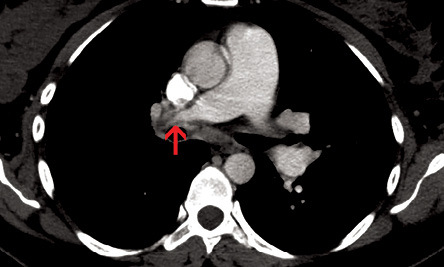 A contrast-enhanced CT of the chest was performed and revealed sudden interruption of right branch of pulmonary artery in its proximal part [Figure 5, blue arrow]. The right hilum was diminutive. Multiple tortuous systemic arteries were seen along the right bronchial tree. Irregular pleural thickening and intercostal collaterals were also seen on the right side [Figure 5, red arrow]. Both lungs showed mosaic attenuation and subpleural interstitial thickening, due to intercostal collaterals, was evident in the right lung [Figure 6]. Patchy ground glass haze and interlobular septal thickening was present in the posterior segment of the right upper lobe, which was likely due to pulmonary hemorrhage. Based on these findings, the patient was diagnosed with proximal interruption of right pulmonary artery. A 36-year-old female presented with massive hemoptysis that had lasted for two days. Following hemoptysis (approximately 150ml of blood), her cough cleared spontaneously every time. Three years previously she had a cesarean section, and she had a history of deep vein thrombosis in her right lower limb, which resolved with medication. She had no previous episodes of hemoptysis or dyspnea. Her chest radiograph showed small right hilum and no lung changes. Conditions such as bronchiectasis, chronic bronchitis, lung malignancy, tuberculosis, and chronic fungal infection are some of the common causes of hemoptysis and are easily detected using CT. The bronchial arteries are the source of bleeding in most cases.1 Actual hemorrhage usually occurs from fragile thin-walled anastomoses between distant bronchial arterial branches and pulmonary arteries that are under high systemic arterial pressure. These are located in the airway submucosa and too small to be directly visualized with CT. Conditions causing reduced pulmonary arterial perfusion, such as chronic thromboembolic disease and vasculitic disorders, lead to a gradual increase in the bronchial arterial contribution.3 In our cases, we discussed the anomalies of pulmonary vessels leading to decreased pulmonary artery pressures, bronchial artery hypertrophy, and hemoptysis. In our cases, we have seen that right pulmonary artery was small which led to decreased pulmonary arterial pressure and bronchial collateralization. Parenchymal abnormalities were subtle and rupture of thin walled fragile bronchial collaterals was the cause of hemoptysis. In every patient, careful analysis of thoracic vasculature provided a clue to the diagnosis and MDCT has virtually replaced the role of conventional angiography in these disease entities. The anomalies of thoracic vasculature whether congenital or acquired lead to systemic collateralization and hemoptysis, which can be life threatening. Therefore, radiologists should thoroughly evaluate the mediastinal vessels with MDCT angiography in every patient presenting with hemoptysis. 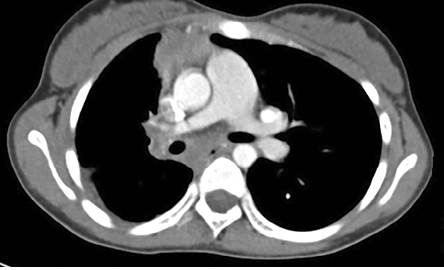 Although secondary CT findings in the parenchyma as well as mediastinum are similar in all three entities, careful evaluation of MDCT images can diagnose the anomaly and the patient can be managed accordingly. Bruzzi JF, Rémy-Jardin M, Delhaye D, Teisseire A, Khalil C, Rémy J. Multi-detector row CT of hemoptysis. Radiographics 2006 Jan-Feb;26(1):3-22. Sirajuddin A, Mohammed TL. A 44-year-old man with hemoptysis: a review of pertinent imaging studies and radiographic interventions. Cleve Clin J Med 2008 Aug;75(8):601-607. Kauczor HU, Schwickert HC, Mayer E, Schweden F, Schild HH, Thelen M. Spiral CT of bronchial arteries in chronic thromboembolism. J Comput Assist Tomogr 1994 Nov-Dec;18(6):855-861. Reller MD, McDonald RW, Gerlis LM, Thornburg KL. Cardiac embryology: basic review and clinical correlations. J Am Soc Echocardiogr 1991 Sep-Oct;4(5):519-532. Heyneman LE, Nolan RL, Harrison JK, McAdams HP. Congenital unilateral pulmonary vein atresia: radiologic findings in three adult patients. AJR Am J Roentgenol 2001 Sep;177(3):681-685. Mataciunas M, Gumbiene L, Cibiras S, Tarutis V, Tamosiunas AE. CT angiography of mildly symptomatic, isolated, unilateral right pulmonary vein atresia. Pediatr Radiol 2009 Oct;39(10):1087-1090. Dixit R, Kumar J, Chowdhury V, Rajeshwari K, Sethi GR. Case report: Isolated unilateral pulmonary vein atresia diagnosed on 128-slice multidetector CT. Indian J Radiol Imaging 2011 Oct;21(4):253-256. Beerman LB, Oh KS, Park SC, Freed MD, Sondheimer HM, Fricker FJ, et al. Unilateral pulmonary vein atresia: clinical and radiographic spectrum. Pediatr Cardiol 1983 Apr-Jun;4(2):105-112. Werber J, Ramilo JL, London R, Harris VJ. Unilateral absence of a pulmonary artery. Chest 1983 Dec;84(6):729-732. Ten Harkel AD, Blom NA, Ottenkamp J. Isolated unilateral absence of a pulmonary artery: a case report and review of the literature. Chest 2002 Oct;122(4):1471-1477. Davis SD. Case 28: Proximal interruption of the right pulmonary artery. Radiology 2000 Nov;217(2):437-440. Kwok KY, Lo SSM, Tsang TK, Fan TW, Kwan TL. Interruption of pulmonary artery. J HK Coll Radiol. 2010;12:170-173. Castañer E, Gallardo X, Ballesteros E, Andreu M, Pallardó Y, Mata JM, et al. CT diagnosis of chronic pulmonary thromboembolism. Radiographics 2009 Jan-Feb;29(1):31-50, discussion 50-53. Shetty D, Rogers PJN, Williams MP. CT pulmonary angiographic imaging manifestations of chronic pulmonary thromboembolic disease.West of England Medical Journal 2011;110:Article1. Auger WR, Fedullo PF, Moser KM, Buchbinder M, Peterson KL. Chronic major-vessel thromboembolic pulmonary artery obstruction: appearance at angiography. Radiology 1992 Feb;182(2):393-398.